What's the deal, California? I thought you blue state hippie jokers were an accepting, open-minded bunch. This is the kind of crap I expect from Virginia, not you. Okay, maybe I'm being too rough on the Golden State, since the moron in this video has Illinois plates - though we don't know how long he's been in California, or if he's just passing through, or if the car is simply from another state. 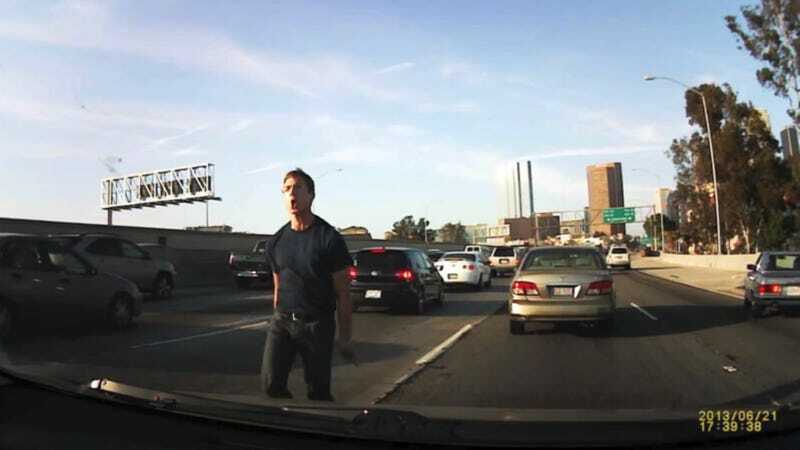 At any rate, a driver on a Los Angeles freeway managed to capture some extreme road rage on his dash cam over the weekend, which he later posted to reddit's r/videos under the name affirmativeuncertain. It's a long clip, but it shows a man in an Infiniti repeatedly brake checking the person who claims to be affirmativeuncertain, cutting off other cars, and hanging out the window to scream at him. At one point, he even stops his car on the highway and does a weird little skip run over to affirmativeuncertain in order to hurl more insults at him. It's hard to hear what he says exactly, but according to a Huffington Post story on the incident, the insults were racially motivated and aimed at affirmativeuncertain's Asian heritage. The man was shouting "the usual asian insults," wrote affirmativeuncertain. "It made me sad how unoriginal they were." Because the video dialogue isn't audible, affirmativeuncertain told local news site LAist that the man shouted, "Go back to Asia," "F*ck you, Asian," "I'll f*ck you up" and "Get out and fight me." [...] "I wouldn't be surprised if he was on drugs," the victim wrote on Reddit. "I have never experienced this much hatred from anyone in my life." The man also threw drinks at affirmativeuncertain from his car. The redditor says he has contacted local authorities to file a report, but has not heard back yet. It just goes to show you that there are crazies everywhere out there, and they have cars.